I go to a lot of live music. Festivals, gigs and conferences. At the majority, sound levels are perfectly acceptable and I leave at the end of the evening without feeling that my ears are bleeding. But sometimes it’s loud. Too loud. At a pub gig a couple of years ago the music was so loud my ears actually hurt for several days afterwards: a clear sign of damage. I spent one Glastonbury working on social media for the dance music area. This meant I got to spend a lot of time in the photographers “pit”, taking photos for Instagram and Facebook. It was such a privilege to be up close to the musicians, but the effect of those speakers so close to my ears was not so great. I used squishy foam ear plugs which certainly muted the sound, but it also distorted it and made it sound mushy. I go to watch live music because I love the music. I don’t want to listen as if I’ve got a sealed plastic bucket on my head but I also want to protect my hearing and not feel as if I’m having an out of body experience the next day. I also like motorsport and ride motorbikes – cue hours of loud background noise that I have traditionally dealt with using custom moulded in-ears (incidently also rather useful when camping at a music festival and trying to sleep). Traditional ear plugs are made of plastic, silicone or foam. These materials absorb the sound but end up muffling it, and do a poor job at absorbing those lower bass frequencies which means for live music you end up with a distorted sound. So I was particularly interested to see an ad for Flare Audio’s ear defenders pop into my Facebook feed. Flare Audio claims that its technology (using metal) retains the clarity of the sound but without the sound levels that cause discomfort (and hearing damage). Launching via Indiegogo Flare Audio (the brand name of the ear protectors is Isolate) have racked up an impressive £1,340,746 in the last few months. They aren’t cheap – £24 for aluminium and £48 for titanium. Plus, as with Apples new cordless ear phones, they are easily lost. I was at a very loud (far too loud) pub gig last night and found myself at the front, with speakers blaring. Even the sound check was painful. Cue my first trial of the Isolate defenders. I actually got better audio clarity with them in than without. The sound levels were so loud that my undefended ears were kind of peaking out but with the Isolates in place, I could actually hear some nuance in the music. Plus as an extra bonus I didn’t have to remove them to talk to anyone. With foam ear plugs I am forever pulling them out to have a conversation. That’s a glowing recommendation. Am I endorsed by Flare Audio? No! A genuine great product and one I would recommend. I have tiny ears so found the three options of ear foams that go around the aluminium plugs (small, medium and large) perfect. The packaging is gorgeous and makes for a fun unboxing when your anticipated order arrives in the post. I was inspired to write a review following this discussion in the Musicademy Worship Community about loudness in relation to PA and church based musicians. Watching the musicians on stage last night (without in-ears so using on stage foldback wedges), most were wearing a motley selection of ear defenders from foam ear plugs through to scultpted plastic options. How frustrating for them (and their long suffering sound techs all of whom really need to hear what is properly happening in the mix) to have distorted sound. And how damaging in the long term to hearing for those who choose not to use any protection in order to hear the pure sound. Flare Audio (a British firm) I salute you to having found a solution here. I’m well aware that my noisy pub gig trial is well in excess of the noise levels that most church based musicians are facing. 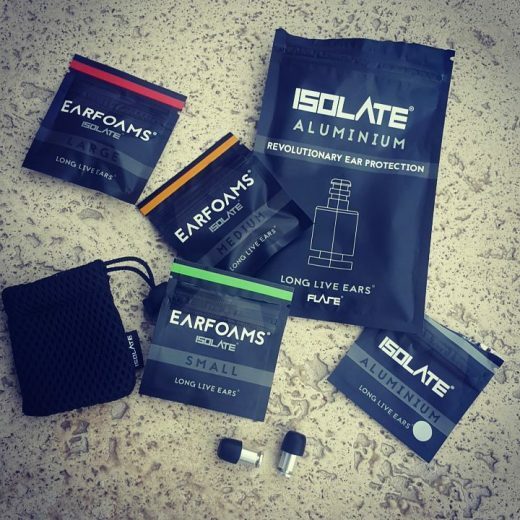 But I’m equally sure that Flare Audio’s Isolate would be a good solution for musicians there looking to protect their ears without mush or distortion of sound. You can find out more about Flare Audio on their website. This entry was posted in Tech stuff and tagged Flare Audio, Isolate. Bookmark the permalink. Trackbacks are closed, but you can post a comment.